Before we go further to discussion, let me just give you guys a brief background of Rin's case. Rin has had this cyst for more than a year now. My sister had though it was just accumulated eye discharge. However, since it kept growing bigger, she finally decided to bring Rin to the veterinarian. It was unfortunate for us to hear that Rin's cyst will keep on growing and that even if they'd try to remove it, the cyst will just keep growing back. So the veterinarian's advise went this way, "If it doesn't bother the dog at all, then it's just better to leave it alone." So we were left with Rin having a large mass growing from her tear duct. As you could see, this was her picture last November 24, 2011. The cyst is now actually smaller compared to a couple of months ago. Poor Gal, the cyst is pretty inflamed because she had accidentally touched it. So I searched the net for home remedies that may help them because of what the vet said- that the mass would just grow back and surgery was pointless. I came across posts of people adding a tablespoon of turmeric in their dog's diet daily which turned out to be effective. I told my sister about it and she was pretty eager to try it on Rin. Last, February 29, I took another picture of Rin's eye cyst and I was pleased that the Turmeric supplement showed positive results. Rin's a pretty big girl. She's more than 7 years old now. My sister had mentioned that a month ago it had been actually smaller than it is right now. However, the person in charge of feeding Rin is not giving her that much Turmeric which is the reason why it's size has grown back. Turmeric is known to be effective at reducing inflammation. As an herb and spice, it is added in people's diet to lower the risk of Alzheimer' and some cancers. Turmeric is also known as an natural antiseptic and anti-bacterial agent. I'm not sure if you guys have had problems like we have encountered with Rin, but feel free to share your insights. It's highly appreciated. Update (8/6/2012): To follow on our next post. I'm so glad you found something that helped Rin so much. Thanks Dip-Dip Mommy. I know what you mean. We are lucky. It's even smaller now! But I forgot to take a picture. I have used tumeric for pain and inflamation in my hip after a car accident...it worked great! So glad Rins eye can get some relief! Well, it's good to know that there are such things as natural herbal remedies that are both good for dogs and humans alike. Tumeric is a wondrous spice! What a difference it made for Rin. That was so great of you to find an alternative remedy for her! We were lucky to have found about it and it would've been even better if we could share her recent picture. But I forgot to take one yesterday because we were too busy. It's even shrunk more. That's so cool that you were able to help Rin, especially with a natural remedy!! Yes, and I'm also hoping that it could also help those doggies whose vets diagnosed them with the same kind of "sac" problem. Interesting. Do you take it in pill form or the powder type? According to a study, most Indians live longer and are less prone to brain related issues because they love eating spices which include turmeric. Nuka has a cyst over her eye and our vet has told us the same thing...I wonder if the turmeric might help her? I think we are going to give it a try. 1 tablespoon per day? How heavy is Rin (weight)? Hmmm... I don't honestly know. But she's the size of a labrador. I think for Nuka, you can give her a tablespoon a day, some even give their dogs 2 tablespoons (one in the morning and one in the evening) but you should start with 1/4 tbsp and gradually increase the amount, especially since some dogs don't like Turmeric. Very interesting, definitely something for Mom to file in her brain. We hope Rin continues to do well. Please do, it might just help someone who's in the same dilemma as we were. You're welcome. She's doing way better than before. Very interesting. I know a few dogs who should definitely be trying that. Wow, I didn't know this. I did recently learned that turmeric could be used as a facial hair remover, and since I am a lady of a certain age, am going to try it out. I'll keep this use in mind also. Thanks! You're welcome. It's also a good anti-inflammatory alternative. Wow - what a difference! I've heard of the benefits of Turmeric before but only as applied to people. Nice to hear it can help with pups as well. Thanks for passing that info along. Welcome. I've read about it from some websites and since we didn't have any other choice, we decided to try it since it was a natural herbal remedy. this is actually not the first time i have heard of this remedy. 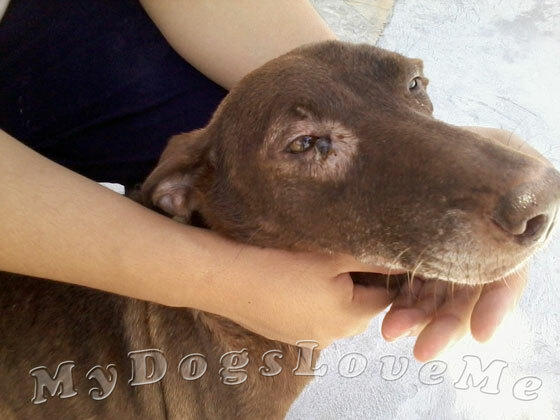 one of our blogger friends used it on a small growth on her dog and it made it dissappear. do you remember the medical term for the cyst? i'm curious as to why the vet said it would grow back after removal. I know what you mean! I was also curious as to why they called it a cyst... shouldn't it be more correct to call it a tumor. Anyway, I wasn't there when my sister had Rin checked out. We live in different regions and I only visit her twice or 3 times a year. Oh my gosh, poor Rin! It looked so sore and I bet it is so unconformable for her at times, strange it would grow back if removed. We are glad the turmeric is helping! We are too! It's actually far more smaller than the bottom picture. wow. great to know...i just had melanoma removed from my eye via laser because it would eventually get larger, interfere with my sight and affect my tear duct...luckily for dogs, melanoma is not as dangerous for us! I am so glad that the remedy helped Rin! Thanks for sharing! You're welcome... I just read it in your blog. I hope you get better soon. We just took our dog Jessee to the vet yesterday and they said they could remove it for $375 to $575. 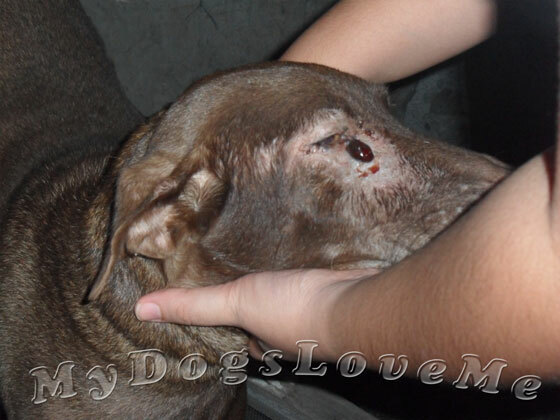 The vet call it a tear duct cyst its on her upper eye lid. I'm going to try the turmeric. I hope you get positive results as we have. Good luck. Please remember that Turmeric will reduce the eye cyst, not remove it. For it to stay that way, Turmeric will be part of Jessee's diet for a very very long time. TUMERIC? Is it safe? I've never heard of it before. The vet costs a fortune and my dog has a heart condition. He took antibiotics, but it couldn't solve the problem. Im really scared! The vet told me the only possible way to solve this is the surgery. Other vet told me he would be fine with occasionally drainage procedures. I don't trust either. It's a simple fluid-filled cyst on hius muzzle. What should I do? Turmeric is an Indian spice used in cooking Curry. Where are you from? I'm assuming not from an Asian country as majority of us enjoy eating curry meals reason why we are familiar with it. If in doubt, you should further research about the benefits of turmeric on dog conditions such as yours. Truth be told, I only came across it through research myself. Furthermore, Rin's condition may also not be the type of problem your dog has (although, with your description, it pretty much sounds similar). The vet had told us that even if we had the growth surgically removed, it would still grow back which is why they further added that if it were not interfering with her lifestyle, then it was best to just leave it alone. A teaspoon in every meal helped in reducing the size of Rin's cyst (I have also noticed that it looked more "dry"). Turmeric is also known for containing C0X2 inhibitors (meaning it's a natural pain reliever of arthritis). Assuming that your dog and Rin have the same issue, it is safe, as long as you stick to a teaspoon (to 1.5 tsp)/meal. And if indeed you decide to use it, expect your dog to smell different.